Lady’s days of wandering across the earth carrying a pack load on her back have now come to an end. She will now spend her remaining days in this dimension, which she so admirably served for the past 37 years, in retirement. Though Lady will no longer be serving the 3 Mule Nation as she has, we are sure she will be serving this nation in ways yet unforeseen. Little Girl and myself will forever be aware of her presence. 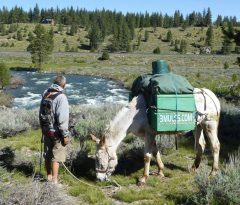 As Lady gave her unrelenting energy to the 3 Mules Nation that energy returns to Lady embodied in these great people – Melinda, Eric, Bonnie and Porvidio, who came forth from the mist to serve and care for Lady. She will now be going to another place where we know she will experience the best of care by Sharon. 3 Mules Nation will be watching Lady and anticipating with excitement to see how Lady’s energy and magic will find yet another way to contribute to the wealth of the nation, the 3 Mules Nation. Here are some photos that Sharon shared with us of Lady settling down in her new home and being welcomed by her horse and neighbor’s pony.